Mechanicsburg High School’s Josh Spinner represented the Indians at the OHSAA Regional Cross Country finals in Troy. Spinner, pictured with coaches Elizabeth Porter and Joe Montoya, placed 33rd among the top 110 runners in the region. Josh is a freshman at Mechanicsburg and has a goal of running for a Division I university following high school. https://www.burgtelegram.com/wp-content/uploads/sites/17/2017/10/web1_Spinner.jpgMechanicsburg High School’s Josh Spinner represented the Indians at the OHSAA Regional Cross Country finals in Troy. 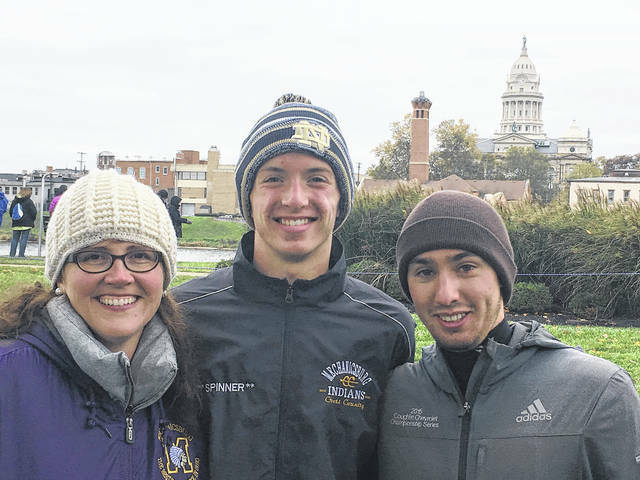 Spinner, pictured with coaches Elizabeth Porter and Joe Montoya, placed 33rd among the top 110 runners in the region. Josh is a freshman at Mechanicsburg and has a goal of running for a Division I university following high school.